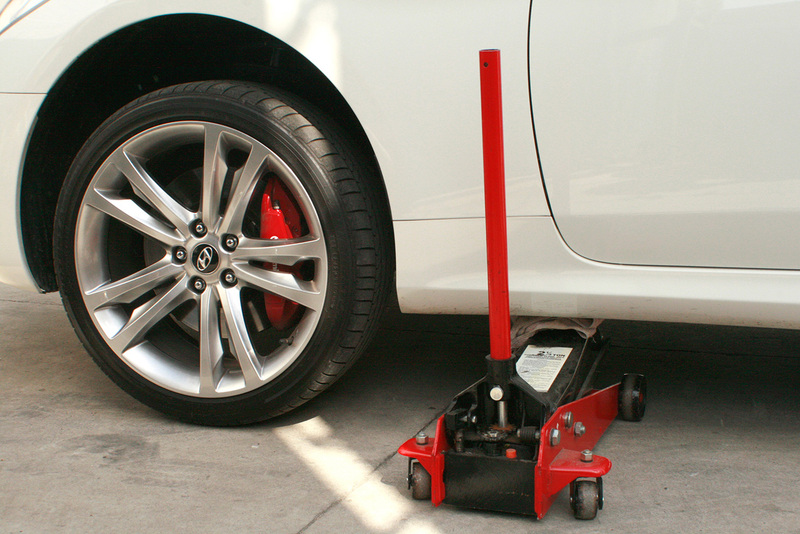 Lift up the vehicle body using a jack or a lift until the vehicle's wheels are off the ground. The coil spring should be loose. 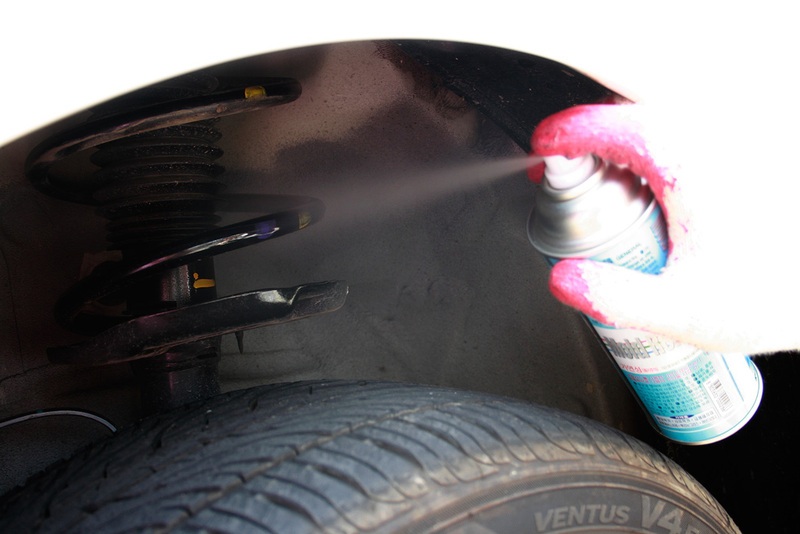 Spray soap water or WD on the coil spring for easy installation. 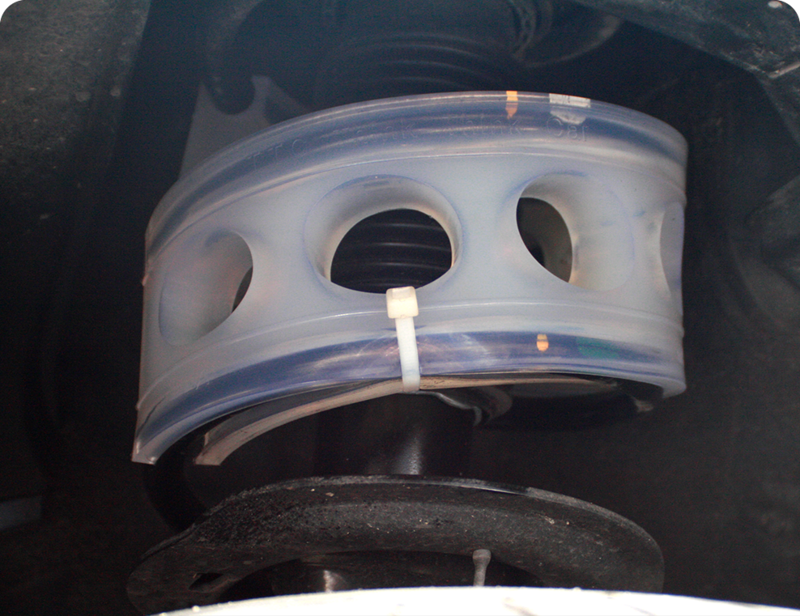 This step makes the surface of the coil spring smooth. 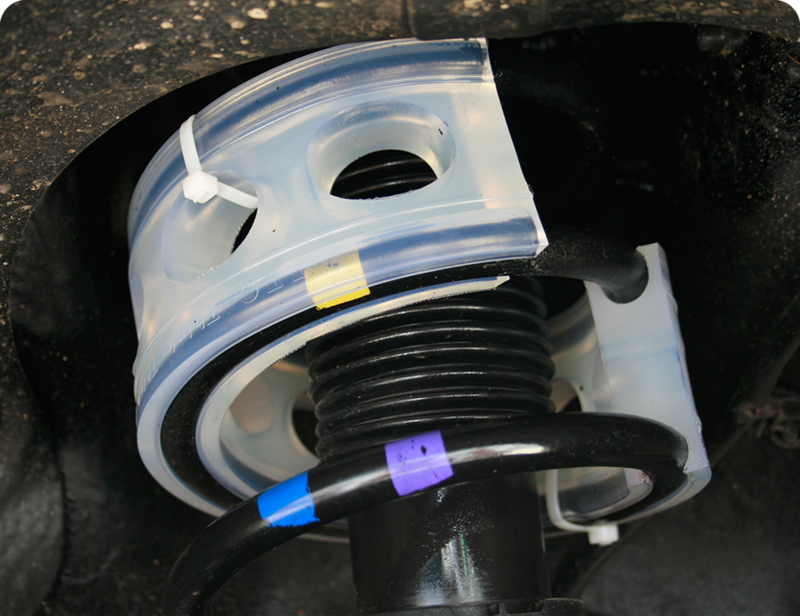 Install the cushion buffer on the coil spring. It will be easy if you smoothly rotate the cushion buffer when installing. 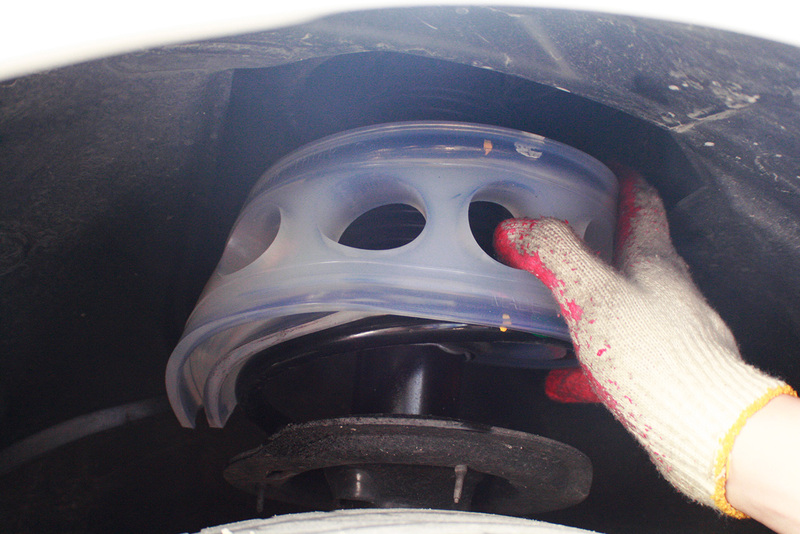 Make sure the grooves of the cushion buffer are well interlocked with the coil spring. If the type of cushion buffer needs to be tied, fasten the cushion buffer and the coil spring with the cable tie. Check if the coil springs are well interlocked into the grooves of the cushion buffer. Otherwise, it can be an improper installation. 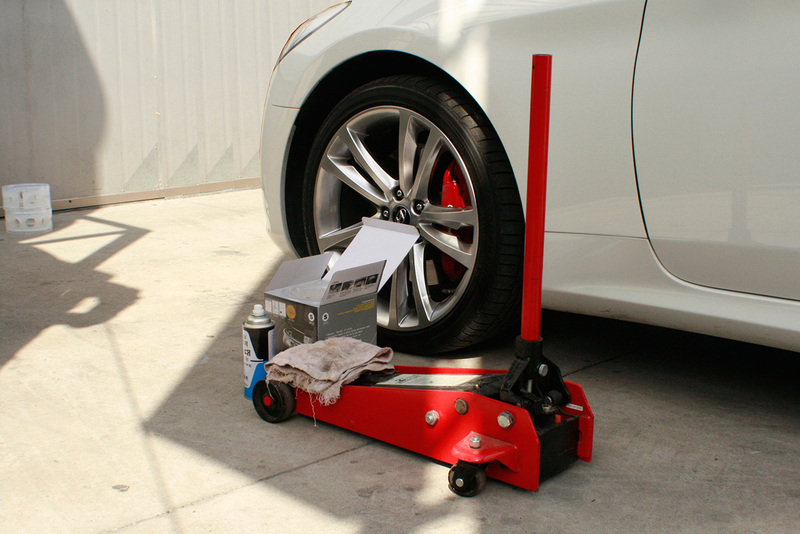 We recommend that the position of the cushion buffer be in the middle of the coil spring. 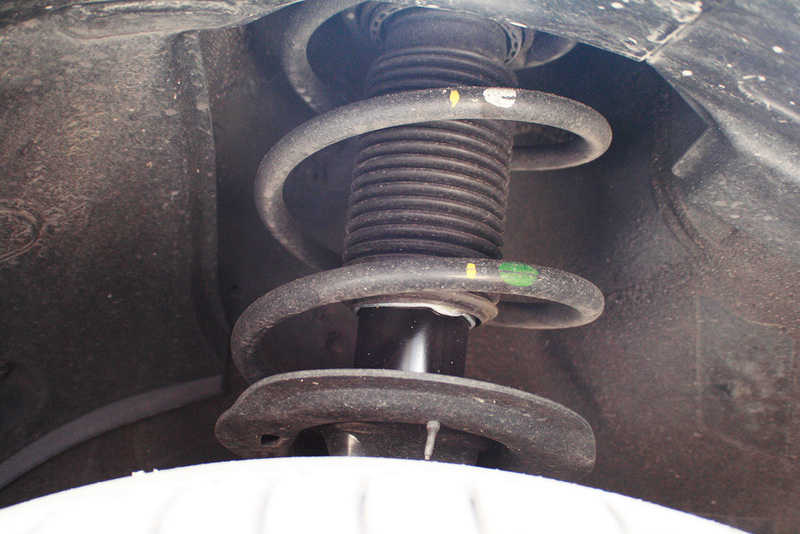 In general case, the cushion buffer should not be installed on the very top or bottom part of the coil spring. 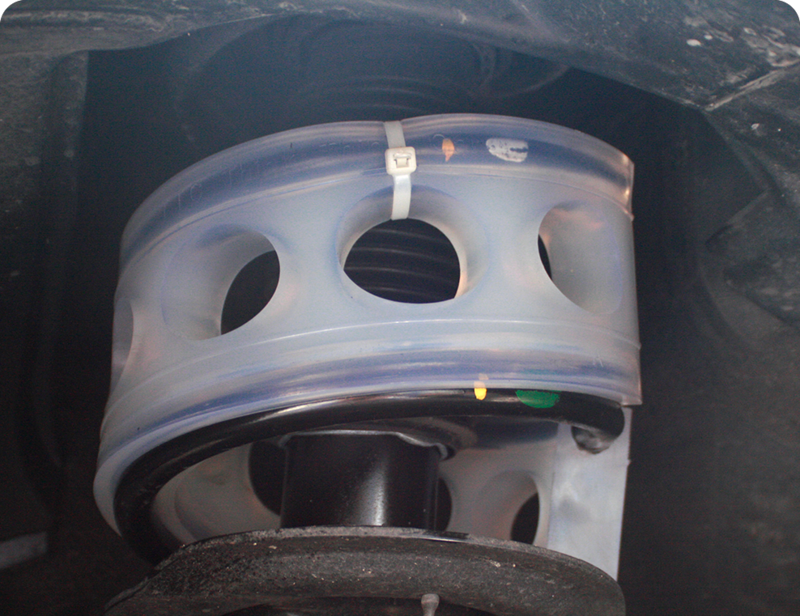 If you install a cushion buffer that does not fit to the coil spring, the life span of the cushion buffer may be shortened. Please refer to the standard size table of cushion buffer by types before you purchase and install a cushion buffer. Or contact our customer support center. You should loosely tie the coil spring and the cushion buffer using the cable tie for the following types of cushion buffer: K, S, A, B. 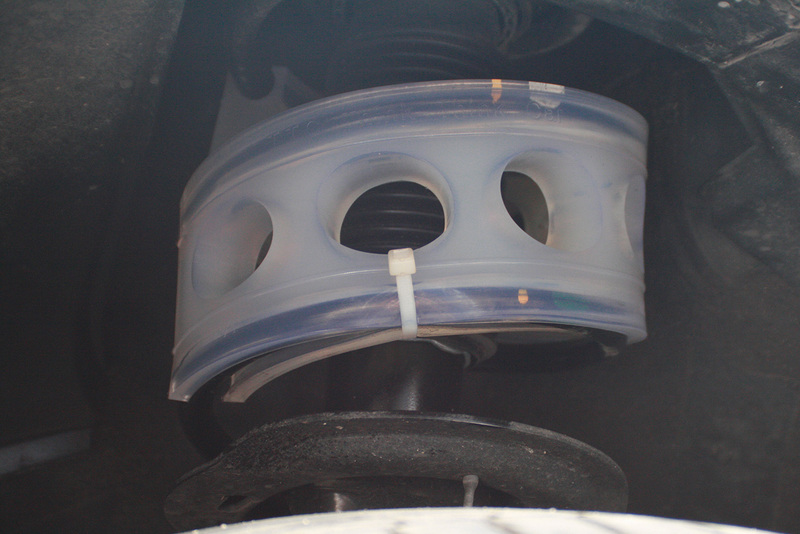 The purpose of tying them is to prevent a detachment of the cushion buffer when the vehicle body is lifted. There is no need to tie them only for driving the vehicle. As seen in the picture, tie the coil spring to the second hole from the right edge of the cushion buffer with the cable tie. As seen in the picture, tie the coil spring to the second hole from the left edge of the cushion buffer with the cable tie. Readjust the cushion buffer to the right position after tying the coil spring and the cushion buffer; then, wrap up the work. Refer to the following safety rules when you install the cushion buffer on your own. Please always be aware of safety while installing it. When you install the cushion buffer: You should park your car on a flat ground where other cars do not run around. When you install the cushion buffer: You should turn off your vehicle engine. It is dangerous to install it while the engine is running. When you install the cushion buffer, the parking brake should be set. When you install the cushion buffer, your vehicle should not have any passenger or load. When you install the cushion buffer, you should select a place where other vehicles are not running around.